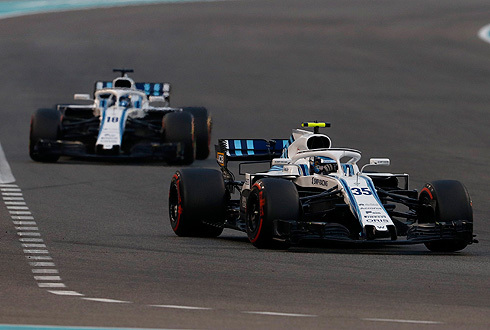 The final race of the 2018 Formula One season would see the Williams Martini team complete another tough race with neither driver scoring points. 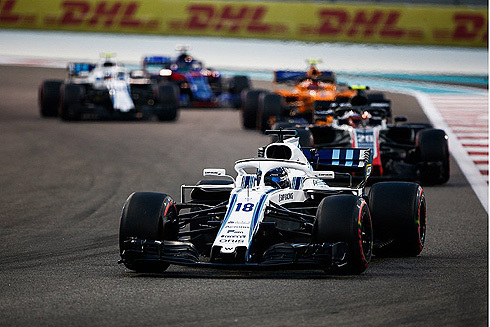 Despite seeing Lance Stroll finishing in 13th and Sergey Sirotkin 15th it was another race that saw both drivers lack the pace hindering them even to be close to scoring points. Both drivers would benefit more from the retirements of others in front of them to give them the positions they achieved in the race. Not a race to remember as the season comes to a close for the Williams team. 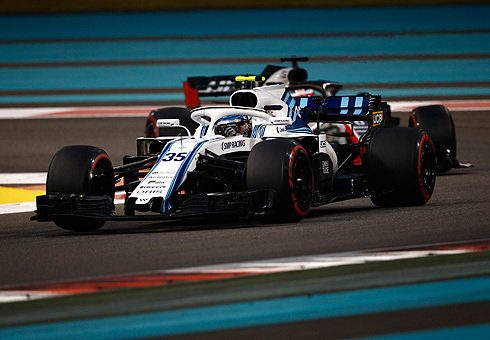 The final race of the 2018 Formula One season the 2018 Abu Dhabi Grand Prix would see the Williams Martini drivers line up 19th and 20th with Sergey Sirotkin leading team-mate Lance Stroll on the grid. Both drivers would be leaving the team after this race so it would be their last opportunity to try to produce a result. The grid would see Hamilton on pole from Bottas, Vettel, Raikkonen, Ricciardo, Verstappen, Grosjean, Leclerc, Ocon and Hulkenberg in tenth. Of the top ten it would be the top five who would start the race on the ultrasoft tyre. The others would be on the hypersoft. Outside the top ten the tyre selections would see both Williams starting on the soft tyre joined by Ericsson, Magnussen, Gasly and Vandoorne. Sainz, Perez, Alonso and Hartley were on the ultrasoft tyre. The grid would complete their formation lap and would return and form up and the lights would go out and it would be Hamilton leading from Bottas while Verstappen had dropped to tenth. But the race would be marred by contact between Hulkenberg and Grosjean which would see Hulkenberg's Renault roll into the barrier. There would be a small fire which was quickly put out. This would see The Safety Car been deployed as they rolled the Renault back over allowing Hulkenberg to get out of the wrecked car. Hamilton was still leading as the accident was cleared with Bottas second followed by Vettel, Raikkonen, Leclerc, Ricciardo, Grosjean, Ocon, Verstappen and Perez tenth. For Williams Lance was running in 15th and Sergey 18th. No action was taken in regard to the Grosjean and Hulkenberg incident. The Safety Car would come in on lap five of fifty five. Verstappen would be fighting with the Force India pair seeing Perez get past but the Red Bull would get back in front to be ninth again. Lance would see Magnussen get past to take 15th while Ocon and Verstappen were fighting with places changing between them. But Verstappen would get past Ocon while Raikkonen would retire on the main straight seeing the Virtual Safety Car deployed. This would see Hamilton leading from Bottas, Vettel, Leclerc, Ricciardo, Grosjean, Verstappen, Ocon, Perez and Ericsson now tenth. Lap nine and Hamilton would pit taking on the supersoft tyre dropping to fifth. Leclerc and Grosjean would also pit seeing them drop to 14th and 18th. This would see the Williams drivers 13th and 16th. Bottas was now leading from Vettel, Ricciardo, Verstappen, Hamilton, Ocon, Perez, Ericsson, Sainz and Gasly tenth. Hamilton would be told that he would be going to the end of the race on the supersoft tyre. Lance was now running in 14th and Sergey 16th. Sergey would be passed by Grosjean to now be 17th. Lap seventeen and Vettel would pit taking on the supersoft tyre to now be sixth behind Ocon. Bottas was now leading from Ricciardo and Verstappen. Vettel would pass Ocon for fifth while lap eighteen and Bottas would pit allowing Ricciardo to lead. 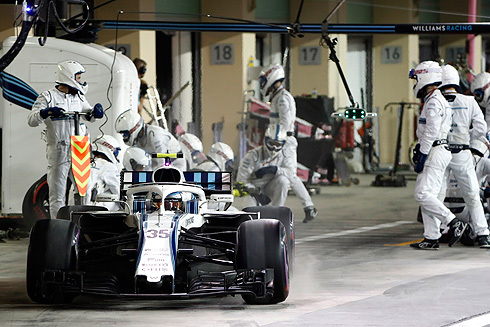 Bottas would come back out in fourth running on the supersoft tyre. Verstappen would pit from third seeing Hamilton and Bottas now second and third. Lap twenty and Ocon would pit dropping to 18th returning on the supersoft tyre. This would see the Williams drivers now 13th and 16th. Drivers would be told that there was the possibility of rain while Sergey would be passed by Ocon but Ocon had changed tyres. A few drops of rain would fall but this was not of concern for the drivers. Sergey would also be passed by Hartley to be the last car running. Sergey had run wide at the final corner allowing Hartley past. Lance was up in 12th as Ericsson retired out on the track with no power. Sergey was now 17th on lap twenty seven. Leclerc would pass Alonso for ninth but both would go up the order when Perez pitted on lap twenty nine. The top ten was Ricciardo, Hamilton, Bottas, Vettel, Verstappen, Sainz, Gasly, Leclerc, Perez and Alonso tenth. Alonso would pit on lap thirty returning in 17th on the supersoft tyre. Lance was now running 11th and Sergey 16th but neither had pitted. Lance would move up one place to be tenth after Gasly pitted. Gasly was ion the ultrasoft tyre and in 16th. Sergey was one place ahead in 15th. Vandoorne was able to get past Ocon and Grosjean to be 11th. But Ocon would get past Vandoorne to take 11th but he had used the run off area to complete the move. Sergey would be passed by Alonso for 16th but Lance was still in tenth while on lap thirty five Ricciardo would pit dropping to fifth and on the supersoft tyre. Lap thirty six and Vettel was able to get past Bottas to be second. Verstappen was now right behind Bottas while Ocon would get a five second penalty for his gaining an advantage. Sergey would finally pit on lap thirty eight changing to the ultrasoft but he was now a lpa down still in 17th. Verstappen would finally get past Bottas to now be third while Ricciardo was now challenging Bottas. Ocon would pass Lance for tenth seeing the Williams drivers now 11th and 17th. Ricciardo would also get past Bottas seeing the Red Bull cars now third and fourth. At the front Hamilton was now leading Vettel by 5.8 seconds as Bottas pitted on lap forty two taking on the ultrasoft tyre returning in fifth. Lance would finally pit on lap forty three taking on the ultrasoft tyre and returning in 15th and one lap down. Sainz would pit on lap forty four taking on new supersoft tyre and retaining sixth. lance was quickly closing in onto 14th placed Hartley. Ocon would be forced to pit and into retirement with no power. This would see Lance and Sergey 14th and 16th. The Force India would stop on the pit lane entry requiring a push out of the way. Gasly would also retire with an engine issue seeing Lance now 13th and Sergey 15th but with only a handful of laps remaining. At the front Hamilton was still leading from Vettel, Verstappen, Ricciardo, Bottas, Sainz, Leclerc, Perez, Grosjean and Magnussen tenth. The race would complete the final laps with the order remaining unchanged seeing Hamilton take victory from Vettel and Verstappen. 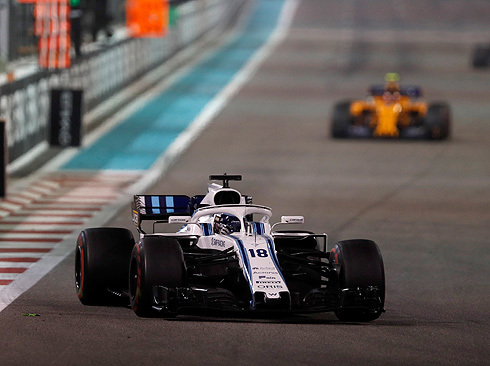 With the finish of the race the Williams team would see their drivers come home in 13th and 15th. Far from a race to remember let alone a season to remember.